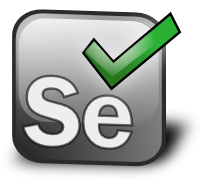 Selenium IDE is a very good tool for recording and troubleshooting Selenium tests, but you are limited to clicking around in a GUI. For a better testing workflow, including load testing, you need to use Selenium WebDriver, which can programatically drive a browser and run Selenium test cases. Now run your regular Selenium WebDriver scripts (no modifications required if they already use Firefox as their browser). A few notes regarding Selenium WebDriver scripts. I was stumped for a while when I was trying to use the “find_element_by_id” form of finding an HTML element on a Web page. It was working fine in Selenium IDE, but Selenium WebDriver couldn’t find that element. I had to resort to finding all elements via their XPath id using “find_element_by_xpath”. Fortunately, Chrome for example makes it easy to right click an element on a page, choose Inspect, then righ click the HTML code for the element and choose Copy->Copy XPath to get their id which can then be pasted in the Selenium WebDriver script. I also had to use time.sleep(N) (where N is in seconds at least for Python) to wait for certain elements of the page to load asynchronously. I know it’s not best practices, but it works. Head of devops at Guidance Solutions. System infrastructure scaling, cloud computing, Golang and Python programming, automated testing.